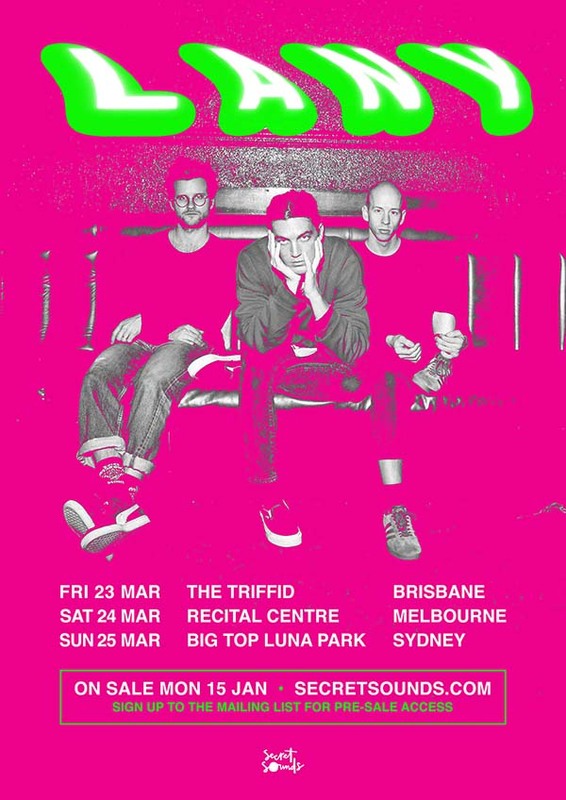 Riding high on an unstoppable wave of recent success, LANY, LA’s finest purveyors of intergenerational alternative music, return to Australia for three huge capital city shows in 2018. Their debut self-titled album, released in June last year, was the highest charting debut album on the Billboard Charts in 2017, and if last year’s Splendour in the Grass set is anything to go by, these will be some of the hottest tickets around. A buzz band from the very beginning, LANY (standing for Los Angeles New York) kicked off in 2014 when Paul Klein, Les Priest and Jake Goss folded their respective musical dreams into one unifying vision. Utilising an ancient laptop and a wealth of ideas, they put together a few cuts of irresistibly smooth synth-pop in the vein of Phoenix and Glass Animals; glowing with charm and melody. On a whim, they uploaded two of these tracks; Hot Lights and Walk Away, onto SoundCloud, hoping for a couple of clicks. What eventuated was an extraordinary torrent of hype. Audiences fell hard for Klein’s breathy vocal style and direct lyricisms as well as the beds of gorgeous, flowing pop that framed them. It wasn’t long before both tunes started racking up millions of Spotify streams, establishing LANY as a band on the rise. Since then, these three maestros’ have made it their mission to continually feed their increasingly rabid fan base, constantly releasing new music and dropping slick videos. LANY’s singles ILYSB, yea, babe no way, Good Girls, WHERE THE HELL ARE MY FRIENDS have clocked up a staggering 17 million collective views on YouTube, with their latest release Super Far gaining over a whopping 10 million views within the space of only a few months. The success of these releases has led them to perform on Late Night with Seth Meyers and share the stage with pop sensation Halsey. After wrapping up a huge 2017 with over 135 shows in more than 28 countries, LANY are gearing up for their biggest year yet, with upcoming performances at US festivals Coachella and Governor’s Ball, along with their upcoming trip down under which is sure to be hugely anticipated by their army of followers.